The visualization above shows a concentration of poor mental health reported in Hartford’s Northeast neighborhood and a corresponding concentration in the South End neighborhoods of Frog Hollow and Barry Square, though the concentrations in the southern portion of the city are more geographically dispersed. 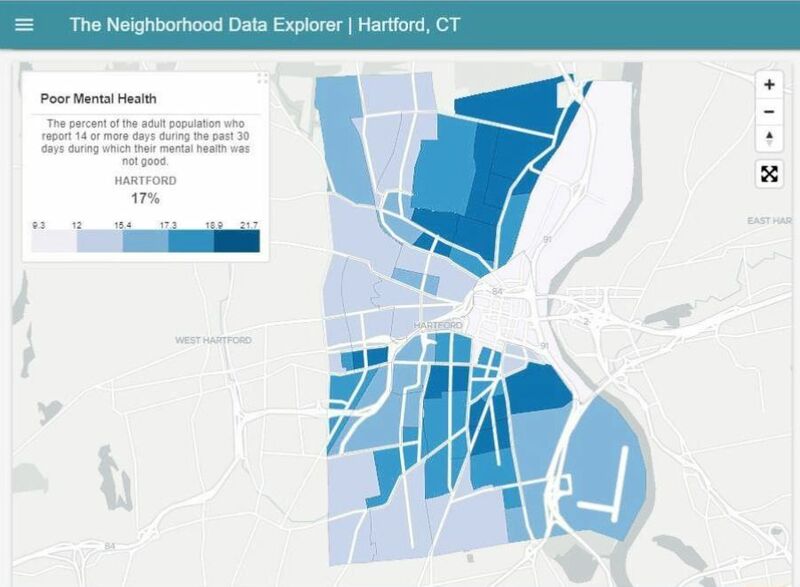 In December 2018, the Connecticut Data Collaborative released our Health in Hartford’s Neighborhoods data story, which examined the relationship between housing in health in the city. To dive deeper at the census-tract level, CTData has created The Neighborhood Data Explorer. This interactive platform allows users to sort data based on health, housing, demographics, and economy to gain a more comprehensive understanding of the key factors that impact Hartford residents. Our assistant director, Rachel Leventhal-Weiner, attended Tapestry this past November, a conference dedicated to digital data storytelling. 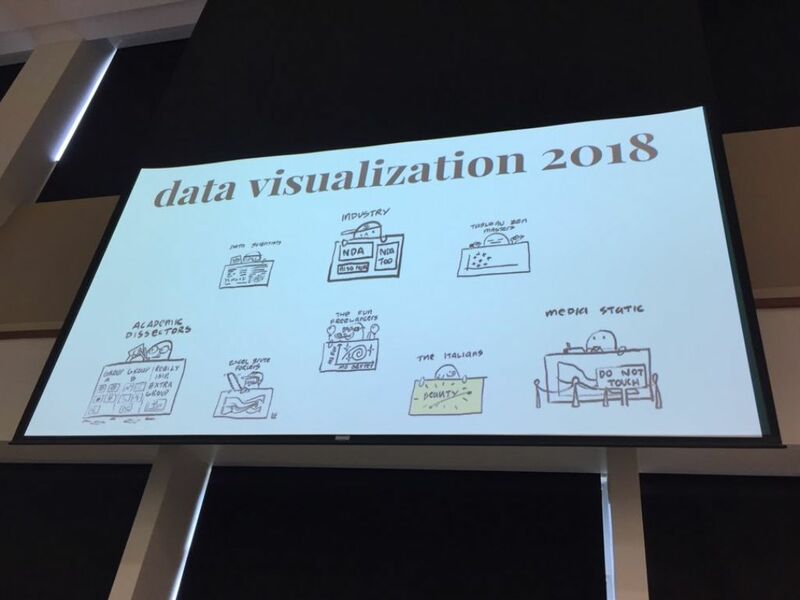 Check out CTData’s Data Storytelling workshop on Wednesday, 1/30 to hear some of the strategies she gleaned from the event, as well as the methods she utilizes for data storytelling. January 30th: Data Storytelling in Hartford, 10:00 am-12:00 pm. Fee is $25. In this workshop, we bring together best practices in data reporting and data visualization, as we guide participants through several exercises to learn how to create effective data stories. Participants will benefit most if they have engaged with our introductory workshop, Data Basics. We ask that participants bring their own laptops to be able to practice and engage in some of the activities. The impact of the government shutdown, the longest in history and entering its 27th day (as of Friday, 1/18), is extensive—from food safety worries to tax return concerns to many individuals and families struggling without paychecks. An often overlooked government function that has ceased operating in many cases is the collection and dissemination of public data. How will the shutdown affect the government’s efforts? The Hartford Courant published an op-ed written by our executive director, Michelle Riordan-Nold, about the importance of the 2020 Census for the state of Connecticut. In case you missed it, we’ve published the article on our blog, and you can read some of it below. “April 1, 2020 might seem like a long time away. But there is work to do before then if Connecticut residents are to be properly counted in the 2020 Census on that date, and there’s a lot riding on it. “Fortunately, there’s also a lot Connecticut residents can do to help. At CTData’s Census 2020 Kickoff, one of the major topics of discussion was the potential inclusion of a citizenship question to the census form. While these are estimates, the consequence of a citizenship question is clear: an inaccurate count could mean less federal dollars for essential programs that are critical to Connecticut residents. Connecticut Open Data recently released the agency high-value data inventories, submitted in accordance with Public Act 18-175. Users can filter datasets on authority, category, view type, tag, and federated domain. Data from the Office of Early Childhood and the Department of Mental Health and Addiction Services are not yet available. We are excited to announce that Connecticut now has its first ever State Data Plan. The plan advanced through three phases and also incorporates feedback from both the public as well as agencies. This is a monumental achievement for Connecticut, and we would like to thank all of those who participated in the process.